Seven of United Way California Capital Region’s donors and volunteers recently were honored by the local nonprofit for their commitment to making a collective impact on the Sacramento region’s education, health and financial stability. Honorees included Richard Bojé and Stirling Price of Carmichael, Ruth Miller of Woodland, Lorrie Wilson of Granite Bay, Lindsey Smith of Sacramento and Pam Stewart of Natomas. The company Nationwide, based in the Arden area, was United Way’s seventh honoree. Bojé and Price were the first recipients of the Bojé & Price Award for Outstanding Volunteerism, which will be presented annually to a volunteer who exemplifies the work of United Way as an individual volunteer and champion for volunteerism in the community. Price first became involved with United Way in 1958. In 1985, he became treasurer, and has served on the finance and administration committee and the Capital Region Foundation. He also is a dedicated volunteer with several other local nonprofits. Bojé also began his relationship with United Way in 1958 and has served as campaign chair, board chair, and on the executive committee. He currently sits on the finance and administration committee and on the Capital Region Foundation Board, among other local nonprofits. Miller and Wilson were named Women in Philanthropy Members of the Year for their work leading United Way’s Women in Philanthropy group, which helps local foster youth prepare for adulthood, and increasing the capacity of the group. Smith was named Young Leaders Society Member of the Year for her work with United Way’s Young Leaders Society to improve the education and health of children in the Sacramento area and grow the presence of the group. She chairs the Young Leaders Society Leadership Council, which is overseeing installation of hydration stations at schools in the Robla School District so more children will have access to drinking water. Stewart received the annual Frances Wisebart Jacobs Award for her longtime service, generosity and passion for the community. As past board chair for United Way and leader of the campaign cabinet, she led United Way to one of the most successful campaigns in the nonprofit’s history. 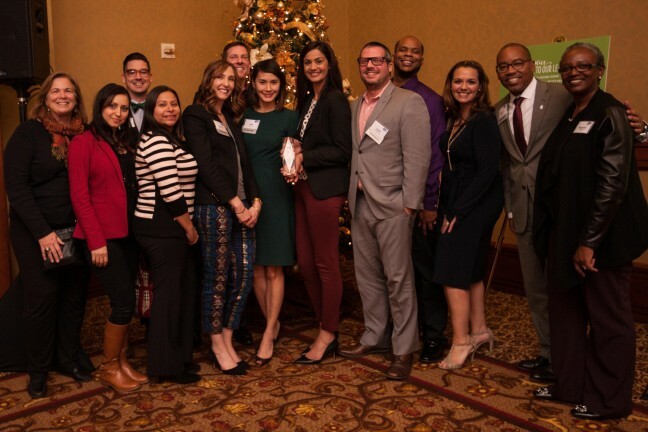 Nationwide received United Way’s annual Cornerstone Award for achieving outstanding results in the company’s United Way campaign and making volunteerism and community engagement part of its company culture. Eighty-four percent of Nationwide employees participated in last year’s United Way campaign, raising more than $247,000. The company has sponsored United Way’s last three Day of Caring events, lending 125 volunteers to the event each year.